You’ve heard this before; If you have a business website, you have to have a business blog. So you set one up. But we want to ask you a few honest questions: Is your blog any good? Is it working for you? Is it making you any money? Blogging is one of the most valuable tools that businesses have to engage with customers and ultimately make their lives easier. 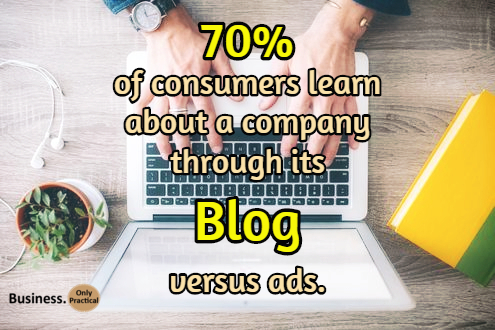 Companies that blog typically have 97% more inbound links than those that don’t, which means more search engine traffic, or SEO for your business. If you’re not blogging, it’s time to get started or get left behind. If you need a bit of inspiration, one of our guest bloggers, Angela Woltman, tells of ways to enhance your business blog by keeping ideas freshly flowing. Everyone knows that blogging for your business is a great way to drive traffic to social media sites, increase feedback and improve your business image. However, once you start a blog, it may not be long before writer’s block sets in and you have no idea what to talk about. You don’t want to fall into the trap of writing posts that are similar to others or, worse yet, simply trying to sell your products or services on your blog. The best thing you can do is keep your blog fresh, unique and informative. Need some ideas? Try one of these next time your inspiration has dried up. 1. Review a book that has helped you in your business. There are thousands of business books out there. You’ve probably read more than your share to help you in your current endeavor, haven’t you? Why not pick out one that was especially inspirational and write a review about it? It doesn’t have to be a new book. In fact, it might even have more impact if it’s not new as there won’t be as many current reviews available. 2. Write a ‘how-to’ post. You don’t have to give away your industry secrets or anything, but teaching your readers how to do something is a great way to increase your credibility and provide your readers value. For example, if you’re in the HVAC industry, write a ‘How to See if Your Air Filter Needs Changed’. If you’re in marketing, try a ‘How to Create the Perfect Press Release’ post. Read more about unique blog ideas here. Angela Woltman has a 15-year history in the publishing and writing industry. The former Editor-in-Chief for a regional business magazine, Ms. Woltman has also worked with numerous authors to help them prepare books for publishing, written book reviews for various online review sites, and has performed editing duties for hundreds of local companies and non-profits. She is currently working on a sports-themed cookbook, helping to launch an on-line media company and continues her work with numerous local authors. You can reach her at angela@esparkmedia.com.